A montage of the total lunar eclipse of Dec. 21, 2010, captured by Robert Vanderbei. Turnabout is fair play: The full moon will be totally eclipsed early Saturday morning (April 4), just 15 days after it caused a total eclipse of the sun. Observers throughout western North America, Oceania and eastern Australia will be treated to a total lunar eclipse Saturday, weather permitting. People in many other locations around the world will witness a partial eclipse. 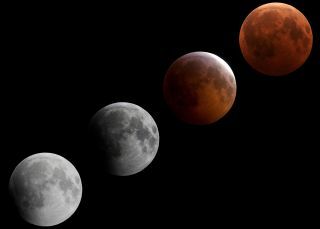 The event is the first of two eclipses of the moon in 2015, will be webcast live online Slooh community observatory at www.slooh.com. Slooh's "Breakfast on the Moon" webcast will begin at 6 a.m. EDT (1000 GMT) at and include views of the event from Australia, Hong Kong and the United States. You can also watch the total lunar eclipse webcast on Space.com, courtesy of Slooh. During the March 20 solar eclipse, the moon crossed the ecliptic from north to south and cast its shadow on the Earth. On Saturday, a half orbit later, the moon will cross the opposite node from south to north, becoming engulfed in Earth's shadow. This visibility map of the total lunar eclipse of April 4, 2015 shows what observers can see based on their location in North America as determined by Sky & Telescope magazine. Saturday's eclipse will be visible to varying extents across North America. The farther west one goes, the better the view, because moonset will be approaching as the eclipse begins. NASA has put together a video overview of the total lunar eclipse, which will be the shortest of the 21st century. Earth's shadow consists of two parts: a faint outer region, called the penumbra, and a much darker inner shadow called the umbra. The moon will enter the penumbra at 5:01 a.m. EDT (2:01 a.m. PDT; 0901 GMT), though the effect will not become evident to most eyes until about 55 minutes later. To spot the penumbra, look for a faint bit of darkness, a "soiled" or "smudgy" appearance on the left rim of the moon. East of a line running from central Minnesota to central Louisiana, the moon will set before total eclipse. From Boston, roughly 11 percent of the moon's diameter will be eclipsed when it sets at 6:26 a.m. EDT. New York will see about 24 percent coverage at moonset (6:39 a.m. EDT). Farther west, the progression of the moon into the umbra will be much greater; in Chicago, for example, it will be 77 percent (6:34 a.m. CDT). The duration of totality, or total eclipse, will be extremely short. According to NASA astronomer Fred Espenak, totality begins at 7:57:54 a.m. EDT (5:57:54 a.m. MDT; 4:57:54 a.m. PDT; 1157:54 GMT) and lasts just 4 minutes and 43 seconds. In fact, this will be the shortest total lunar eclipse of the 21st century. This is because the moon will just barely become entirely immersed within the umbra. In fact, at mid-eclipse, the moon's northern limb is tucked within less than 2 miles (3.2 kilometers) of the outermost edge of the umbra! Around the time of totality, the moon should appear to glow dimly with a ruddy or coppery glow, the result of all the sunrises and sunsets occurring at that time on Earth, whose light has been refracted (bent) into the planet's shadow. After totality, the western half of North America will see the moon gradually emerge from the umbra. For most observers, moonset will intervene before the moon completely exits the shadow, although along the West Coast, the moon's last contact with the umbra (on its right/western rim) can be glimpsed before local moonset at 6:44 a.m. PDT (1344 GMT). Interestingly, while the duration of totality of the lunar eclipse is exceedingly short, the time from when the moon first touches the dark umbra until the moment totality begins is abnormally long, running 102 minutes. Why so long? In part, this is due to the moon's path into the shadow; the satellite's upper limb gives the umbra's outer edge a glancing blow. But more importantly, the eclipse comes three days after the moon arrived at apogee, its farthest point from the Earth. So the moon's orbital velocity is quite slow, and the natural satellite will take a rather leisurely trek through Earth's shadow. In contrast, during the next total lunar eclipse, on Sept. 27, the moon will be within an hour of perigee, its closest point to Earth. On that date, the so-called "supermoon" will take a deeper plunge through the umbra and will also be moving close to its maximum orbital velocity. So from the moment of first umbral contact to the start of totality, only 64 minutes will elapse. The upcoming lunar eclipse will occur on Easter Sunday in some parts of the world. At first, this doesn't seem possible, since, according to ecclesiastical rules, Easter falls on the Sunday that follows the first full moon of the spring season — the so-called Paschal Moon. For most parts of the world, the first full moon of the current spring season occurs tomorrow, on a Saturday. And in this particular case, there will also be an eclipse. The next day is Sunday (April 5), and that is the day designated as Easter. However, if you head far enough to the east of the Greenwich meridian, which goes through England, Saturday's full moon becomes Sunday's full moon. At Greenwich, mid-eclipse occurs Saturday at 12 p.m. local time. But for New Zealand and easternmost Russia, clocks run 12 hours ahead of Greenwich — that is, at midnight on Easter Sunday.